Our focus is on presenting material that soothes, stimulates, and awakens emotional and sexual understanding through learning and interpreting the Tarot," write the card reading husband and wife team in which they share more than a quarter century experience with the tarot and as life partners. Begin with the simple, yet never-before-writen-about premise--every card and its reverse have romantic and sexual indications. And whether you're a newcomer to tarot, a longtime student, or somewhere in-between, Tarot d'Amour will unveil a whole new way to interpret the cards. 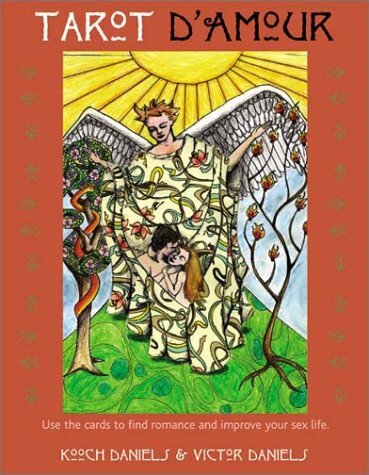 Kooch Daniels has been reading tarot cards professionally for over 25 years. She is a priestess, a scholar of metaphysical traditions, and a practitioner of traditional Tantra who teaches workshops, leads rituals, and has a local daily radio show. She was part of the team that created The Timely Tarot, a computerized tarot that divines personal readings. This is her first book. Victor Daniels, Kooch's husband, is a Professor of Psychology and former chair of the department at Sonoma State University. When Kooch was hitred to read cards at a party at Joe Montana's house, Victor, a huge 49ers fan, took a crash course so he could go to the party with her as a second reader. He has been using the tarot as a tool for psychological insight and personal growth ever since. With Lawrence Horowitz, he is the author of being and Caring: A Psychology for Living. The Daniels live in Marin County, California.